The ultimate and award winning online platform helping busy women all over the world to lose weight, tone up and feel happier in themselves without stepping foot in a gym. Weekly check ins & monthly reviews for accountability. Warm up / stretching videos so you know exactly what to do. ‘How To’ videos to ensure you carry out exercises correctly. Different workout categories including a ‘Beginners’ section. Unlimited access to me personally. Access to 100’s of short videos for motivation and tips. £15 off a personalized 6 Week Nutrition Plan (MAX Experience PLUS). No contract, no fuss, cancel any time. ALL for only £19.99 per month. “I was never comfortable in the gym or gym based exercise classes. 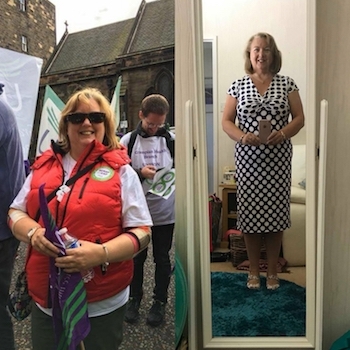 In 10 months I have lost over 3 stone in weight and dropped about 3 dress sizes but more importantly I’ve become fitter, healthier and happier. I’ve regained my self-confidence and my self-esteem and have found a competitive streak I never knew I had. Lee is so encouraging and motivating, you can exercise at home at your own pace and our private Facebook group helps keep you motivated and on track. If you fall off the wagon there is always support and encouragement from the other group members and the weekly check-ins help to keep you focused. Lee is always available for advice and handy tips. I started with small changes to my diet, lifestyle and exercise routine and am now reaping the benefits. Since starting, I’ve lost a total of 13 inches off wobbly bits all over. My tum has been feeling less bloated so measured this morning – down 1.5 inches. I’ve lost a total of 16.5 inches of wobby bits; I feel fitter; stronger; and happier. I also feel happy in my clothes and fit back into a pair of jeans that were too tight previously. I am MUCH more positive and actually enjoy working out now that my fitness level has increased. Also down half a stone with inches lost all over!